If you read food blogs, then you’re probably aware of the Daring Bakers, a group that started a little over two years ago. The brainchild of Yvonne and Lis, it started small – just a group of bakers who wanted a new baking challenge every month. The group grew to include thousands of bakers all over the world, recently launched a new web site, and this month initiated the Daring Cooks, which will focus on cooking challenges. My decision to participate in this group certifies that I have lost my marbles. I have been crazy busy this year. 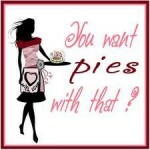 And yet I blog, participate in The Daring Bakers, Tuesdays with Dorie, Pies with That (are you sensing a baking addiction here?) and, far too occasionally, I join the Bread Baking Babes and Bread Baking Day. I also decided to sign up for Recipes to Rival last year, because I figured that woman cannot live by yeast, flour, butter, and cream alone. Last week, I went round the bend and, cackling like a lunatic at my computer, I hit “send” and joined Natalie’s new endeavor, baking through the Bread Baker’s Apprentice (for this, I blame Susan of Wild Yeast Blog, because she wrote about it. If I hadn’t read her blog, a regular addiction, I would have remained blissfully ignorant). Despite all this, moved by an unfathomable force, I joined in the Daring Kitchen’s maiden voyage and made ricotta gnocchis. Lis and Yvonne chose the recipe from The Zuni Cafe Cookbook: A Compendium of Recipes and Cooking Lessons from San Francisco’s Beloved Restaurant . What a great choice! I grew up making potato gnocchi at home, and I hadn’t made them in years, an oversight I’ve been wanting to remedy. After reading about the troubles others had if they didn’t drain the ricotta enough, I made sure – or thought I made sure – to drain the ricotta. It still wasn’t enough, so I added a couple tablespoons of flour and a little extra parmigiano reggiano to help these little guys hold together. I grated a little lemon zest into the mixture, as well as some salt and pepper. I threw together as simple tomato sauce, and topped the whole thing with a little more parmigiano reggiano. 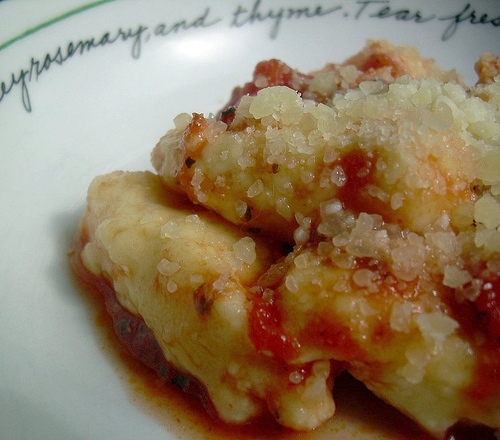 I have to say, after the whole draining-the-ricotta thing, these dumplings are really fast and easy to make and cook. And want to hear something funny? I used a tub of frozen ricotta that I had stashed away a couple months ago. 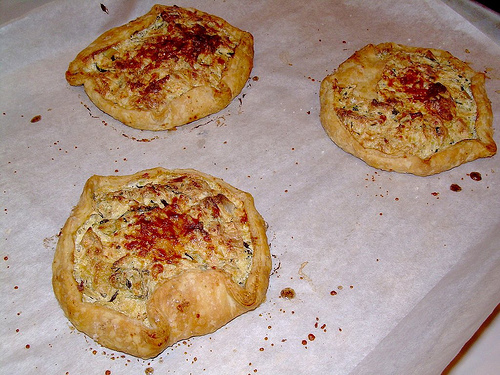 So now you know – the recipe works with frozen, thawed ricotta. The verdict? Wonderful taste, just wonderful. Somehow I hit just the right of lemon zest – enough to enhance the mixture, but not enough to overwhelm it. Texture? It was light and fluffy, but I think I’m a potato gnocchi gal at heart, and that’s probably what I’ll stick with in the future. I like a tad more density to my gnocchi. But I am so glad that I gave this a try. If you’d like the recipe, check out Lis’ blog, or here, and the Daring Kitchen website to see the results of the other cooks. Recipes to Rival – Homemade Ricotta and the Giveaway! Remember to enter the cookbook giveaway! This month’s R2R challenge – homemade ricotta – is brought to us by Lauren of I’ll Eat You. The first time I tried to make it, I discovered that my milk had gone sour, BEFORE THE EXPIRATION DATE, and I hadn’t yet opened the container. But that is an issue I will take up with my local merchant. The next time I made it, things worked a lot better, even though I didn’t have the right kind of cheesecloth. The process is not complicated at all, albeit a little time consuming. In terms of the end product, what I noticed is how much creamier and sweeter homemade ricotta is from the commercial variety. Instead of making a savory dish (I had planned on lasagne), I had to think fast. I’ve been traveling a lot lately, and that has really put a crimp in my cooking. Oh, and the fact that I was without an oven for about a month. So, I threw together a light . . . something. It could be dessert, or it could make a nice light snack or breakfast. I combined the ricotta with some non-fat yogurt and homemade passion fruit sorbet, then topped the whole thing with frozen blueberries. The result? I am shocked to say this was delicious. 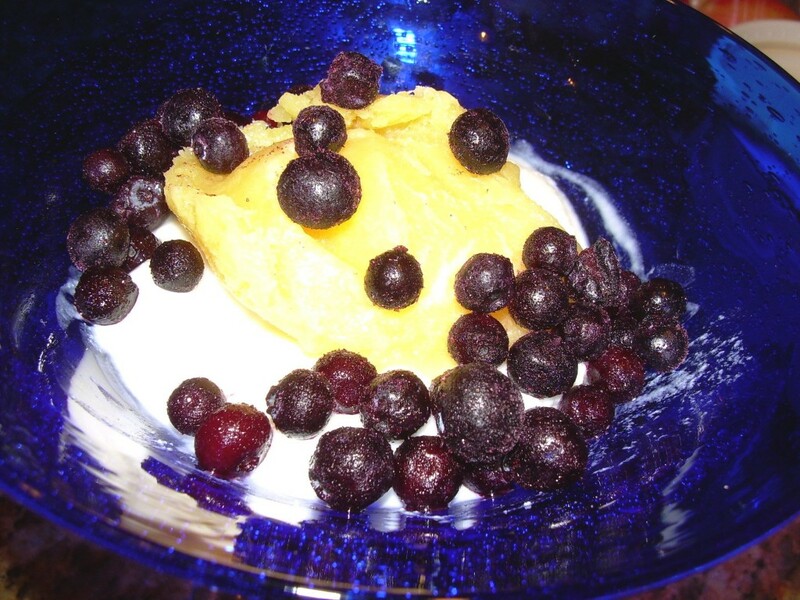 The ricotta was slightly sweet, the yogurt was tart, the sorbet was tart and sweet, and the blueberries added some texture and another flavor element. This was so good, that I’m seriously thinking of eating this on a regular basis. Thank you, Lauren, for a great pick. 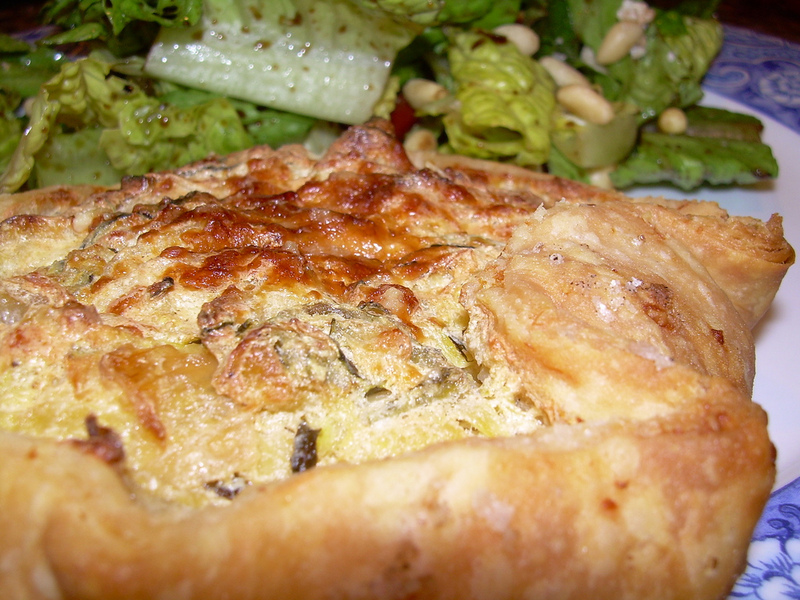 Be sure to enter the giveaway, and check out what others made with their ricotta! This week’s Tuesdays with Dorie turned out to be my favorite one so far, something I wouldn’t have guessed before I made the Fluted Polenta and Ricotta Cake. I had the recipe bookmarked as one I wanted to try, but it wasn’t at the top of my list. I’m so glad that Caitlin of Engineer Baker chose it for this week, because it turned out to be a type of stepped-up cornbread, a big favorite at Chez Chow. The recipe also helped me Clean Out the Pantry, an occasional them on this blog. I had cornmeal, organic frozen ricotta, and four ounces of Kerrygold unsalted butter that needed to be used up, so I pulled these out, thereby freeing up some much-needed freezer space. Tip: always store your cornmeal, well-wrapped in the freezer, as it can turn rancid with remarkable rapidity. And sniff it before you use it – it should have a clean, corny smell, and should not smell stale. 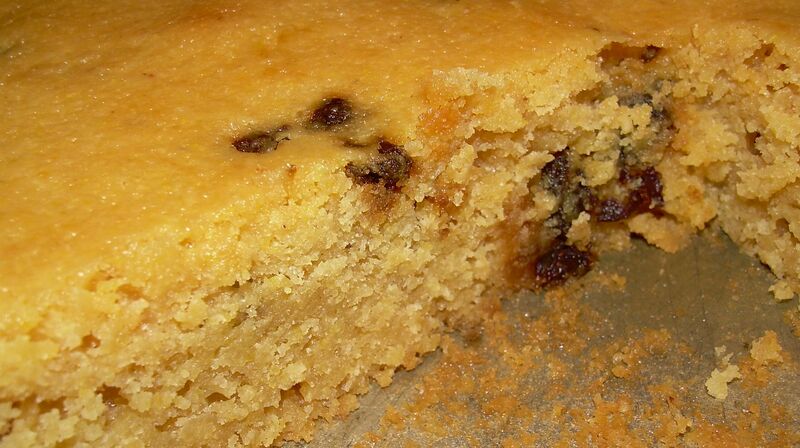 When you are making a baked good with simple ingredients and pure flavors like this cake (as opposed to a jalapeno cornbread), don’t take a chance on some funky cornmeal spoiling the flavors. I cut back the sugar to 1/2 a cup, substituted currants for the figs, and mixed the whole thing in my food processor. That was it! Nothing complicated about this recipe, and because I was also busy baking for the Bread Baking Babes and the Daring Bakers, I was grateful that I didn’t have to be whipping egg whites or watching a double boiler. The cake was dense, moist, and flavorful – the lemon came through but did not overpower. 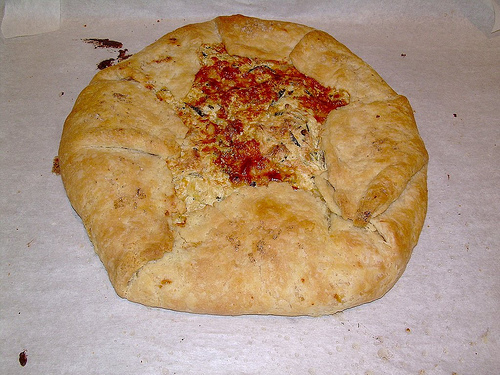 I am so glad that I used a premium butter and ricotta – I think it made a difference. Using frozen ricotta did not affect the cake at all. 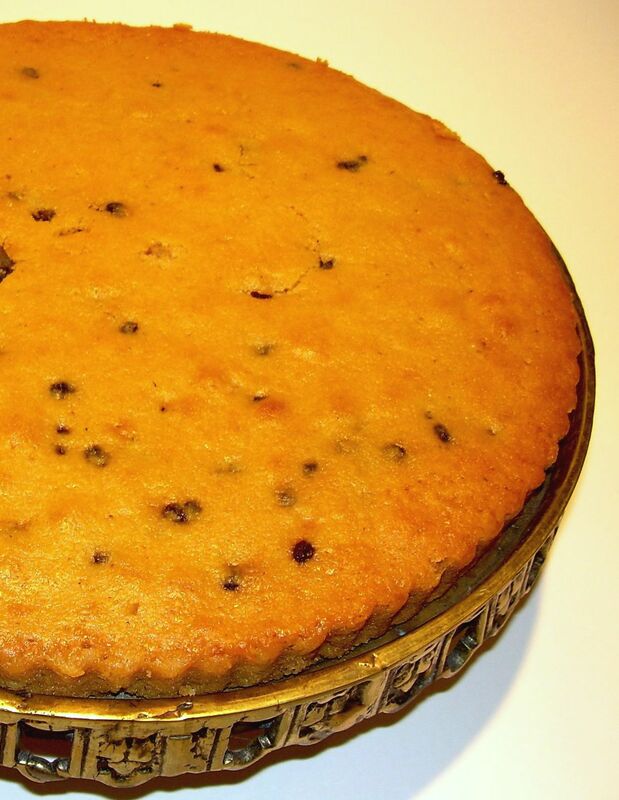 The currants were perfect, and I liked how they peaked out through the cake, so I decided against dusting it with sugar (which also would have made it too sweet). 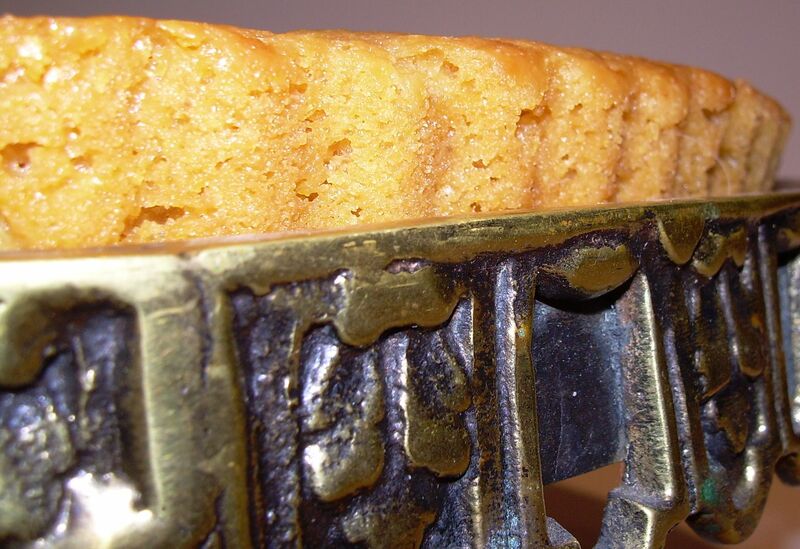 Finally, today marks my second anniversary blogging, so I put the polenta cake on a cake stand that I inherited from my late mother, a wonderful baker, cook, and mum. Please be sure to check out the Tuesdays with Dorie’s ever-growing blogroll to see everybody else’s creations, and Engineer Baker for the original recipe. Below is my adaptation. Next Week: Peanut Butter Torte. Check that the currants are, indeed, moist and plump. If they are the least bit hard, toss them into a small pan of boiling water and steep for a minute, then drain and pat dry. Whisk the polenta, flour, baking powder, and salt together. Set aside. In the bowl of a food processor, mix the ricotta and water together until very smooth, about three or four pulses. Add the sugar, honey, and lemon zest and pulse a few more times until light. Pulse in the melted butter, then add the eggs one at a time, pulsing until the mixture is smooth. Add the liquid mixture to the dry ingredients, mixing only until they are fully incorporated. You’ll have a sleek, smooth, pourable batter. Pour about one third of the batter into the pan and scatter over the currants. Pour in the rest of the batter, smooth the top with a rubber spatula, if necessary.